The Kibbitzer-in-Chief has taken it upon herself to bring some very interesting Weird Sodas in the last few days. I'm looking forward to sampling most of them. This one, I'm not quite as sure about. The K-i-C had told me about some of the oddities she encountered during a previous visit to Frazier Farms. Amongst these was some variety of sauerkraut-flvored beverage. I expressed astonishment at the concept, and admiration for the Weirdness it represented. She seems to have taken that to mean that the idea of consuming a sauerkraut-flavored beverage is appealing to me. I hate sauerkraut. I can't stand the stuff. I can eat a variety of odd foods, and my capacity to consume strange beverages I will happily place against that of most other mortals; I have not vomited in about twenty years. A sauerkraut-flavored drink, though...*shudder*...but no. And No! And NO! again. This is my mission, my raison d'etre, my sacred trust. It's not a soda; it's not carbonated. But it's Weird, and thus, as the Quaffmaster, it is my duty to quaff it. And so I shall! It's called Biotta Digestive Drink. I remember a funky movie from the 80s called The Stuff, about a dairy dessert which was, in fact, alive, and controlled the minds of those who ate it. The tagline was something like "Are you eating it...or is it eating you?" Calling something a "Digestive Drink" is uncomfortably reminiscent of that ambiguity. Below the title is a picture of a cabbage, and the ill-omened words "Organic Sauerkraut Juice". A friendly label on the side reassures me that this drink is "Gut-Friendly". The ingredients list includes only sauerkraut juice and dairy-free lactic acid, so this ain't gonna be sweet. It's made in Switzerland, apparently. This may test even the neutrality of the Swiss. Color: slightly murky pale yellow-green. Euurgh. Scent: Oh God. Foul, foul, foul. Acid and sour, heavy. Very strong smell, enough that when I opened the bottle, the smell rapidly permeated the room. Actually made me shudder with horror. Taste: UUuuhhhhhh...ugh...oh lord. Intensely sour, the lactic acid overwhelming. Vinegar too, vegetable like canned green beans. I can only take this a sip at a time. Let me try it again. Aaaagh. I can't quite control the revulsion; this is making me want to puke. This is not "Digestive Drink", it's "Digested Drink". It tastes rather a lot like heartburn. This is awful in a way I had not previously experienced awfulness. When people write "I threw up in my mouth a little" after seeing something nauseating, they don't know what they mean. I don't have to throw up in my mouth a little after drinking this, because it has happened already. The Biotta Digestive Drink is the all-in-one, it encapsulates both the stimulus and response of nausea. AAAARGH! My stomach is cramping, trying to betray me. It's resenting this usurper of its role, insisting that if vomit is required, it can supply it. It wants to demonstrate its readiness. I must dominate my own viscera. The lactic acid part isn't actually so bad. After a few sips, the aftertaste mostly comes from it, and so it's not totally unlike the aftertaste of cottage cheese. I like cheese. I do not like sauerkraut. And I don't like the Swiss anymore either. This is the beverage version of a war crime. I must sip it again. Just once more, and I can rest. I will have consumed a glassful of this, the foulest thing I think I have ever quaffed. My duty will be fulfilled, and I can be free. Even though it mean my puking, I shall accomplish this task. Here goes. I'm doing this over the sink, though. O woe, O suffering, O Discordia! I did it, and I didn't vomit. Actually, it was slightly easier. I think the sauerkraut is fading a bit. Oops...spoke too soon. The burp brings it back. Eeesh. I may have to review something else tonight, lest I be haunted. The only thing the K-i-C has to say: "It smelled like bedsores." Quaff rating: 0.5. When the only redeeming quality of a Weird Beverage is that it tastes slightly like cottage cheese, "Quaff" does not really describe what one might do with it. Cough rating: 4. I almost puked. The K-i-C, after smelling it, refused to taste it. And it made me write seventh-grade death poetry. I've heard of yerba mate. Rumors whisper of a tea-like substance brewed in South America, which is supposed to infuse godlike powers into those consuming it. It has a fair amount of caffeine, as well as some of the same complex chemicals found in chocolate. It's made by steeping the leaves and twigs of a certain plant in hot water for a while, so it's kind of like tea. "...the strength of the one who consumes the yerba mate shall be twice that of an ordinary man, and his speed shall likewise be that of two men. Strength and speed, being two principal virtues of the warrior, lie as the two strong legs of a wall, forming a space between like that formed in a square. This is why the scholars call it a "right angle", for it is full of virtue. The warrior's virtue is like unto a line connecting the extent of his strength and speed. How, then, shall we measure this virtue? The virtue of a warrior is like unto his strength multiplied again upon itself, plus his speed likewise multiplied, since they build upon themselves. However, the true warrior also possesses humility before the gods, and so must reduce himself according to his own measure. His virtue shall thus be measured as the square root of the sum of the squares of his strength and speed, and thus the holy yerba mate makes a warrior like unto a man with virtue twice his own, multiplied again by virtue equal to that of the square root of his doubled virtue." --from the ancient Peruvian text "The Geometry of Bloodshed". Imagine my excitement at finding a Weird Soda based on yerba mate! 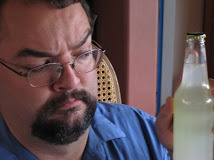 After quaffing it, I shall be like 2(root 2) Weird Soda Reviewers! Where and when: purchased 4/11/09 at Galco's, Los Angeles. Color: orangey-brown. Maybe slightly greenish at the edges. Scent: sweet, with a bit on tang and tiny hint of bitter. Similar to the Guarana Antarcticá. Taste: Interesting. Surprisingly clean, not as cloying as the scent made me suspect. Sweet, not all that strong, with the initial tart fading quickly to a sort of berryish taste. That fades quickly too. Pleasant. The aftertaste is faint, slightly tart, with only the barest hint of herbal or bitter. It's a little like the Sidral Mundet. The Kibbitzer-in-Chief says it tastes like Red Zinger tea. I think it's a little less tart than that, but the undertones are very similar. There's a very delayed aftertaste; the slight tart/herbal made a surprise encore around 3-4 minutes after my taste. I've never had such a delayed yet distinct aftertaste before. I figured that after quaffing this, I should go out and demonstrate my 2(root 2)-times-normal strength and speed to the world. I'm never trusting ancient Peruvian warrior mathematicians again. Quaff rating:3.5 for the taste. -25 for the embarrassment caused by my naive trust of Peruvian warrior mathematicians. Cough rating: 0.5. Maybe just for the slightly strong sweetness. It's hot today at the Weird Soda Lab. You'd think that this would be expected in the San Diego area, yet it always seems to take people by surprise. When it's hot like this, one looks for something cool, crisp, and refreshing. Something which will dry the sweat beaded upon one's brow. I have found something whose label I cannot read. In my pilgrimage to Mitsuwa, I began filling my cart with anything which looked particularly Weird. There was no paucity of candidates; Mitsuwa is long on Weird stuff. But this one stood out as something particularly weird. First, the name. The bottle is in Japanese, which I cannot read, but the little stick-on label for gaijin says it's "Gabunomi Melon Cream Soda". I like cream soda, and I like melon a lot. I've never seen them together...but it's right in line with our mission. Second, the color. At first, I thought it was the bottle. It's not--the soda itself is actually a milky, opaque spring green. It seems to be a picture from something called "One Piece". I've never heard of it, but based on the image, I'm guessing the plot revolves around the Dread Pirate Vestman, who is extremely frustrated by the fact that Slash (who he picked up from Aerosmith) has been possessed by Baron Samedi and is singing opera. The top five ingredients are carbonated water, sugar, glucose (sugar), powdered milk, and fructose (sugar). Melon flavor is lower on the list. Color: opaque bright lime green, like key lime pie. Scent: Hmm. Actually, it smells a lot like key lime pie, too. Or maybe bubblegum. The Kibbitzer-in-Chief and Lead Assistant Tester say it smells like bubble gum, specifically Bazooka. I can smell it, but there's something fruity too. That must be the melon. Or maybe they were dyslexic and put in lemon instead. And a miky creamy scent. Taste: A bit more tart than the smell. That may be the melon (it does taste a bit more like melon than it smells), but it might actually be the slight tart/cheesiness of the milk. It's sweet, and the bubblegum is there, but there is a taste which is actually pretty reminiscent of honeydew melon. Lead Assistant: "(tastes) Bleah. (tastes) Tastes like carbonated bubblegum. (tastes some more) I like it." The carbonation is very light. This is odd, but actually fairly nice. The taste is mostly bubble gum, with honeydew melon and milkiness underneath, followed by the faintest hint of cheese. Aftertaste is mostly melon and milk; the bubblegum fades fast. The cheesiness is not as unpleasant as it sounds. It has virtually none of the musk of melon. The cheesiness is probably the protein in the powdered milk. The Lab staff is now debating whether one could make a drinkable cheese soda. The K-i-C believes that one could make a cottage-cheese soda which would be not unlike boba (which we both dislike). I think that you'd be better off with trying to go for cheddar. If anyone can find cheese soda, I'll give it a try. Quaff rating: 2.5. Drinkable, if odd. The cheesiness is weird, especially with the bubble gum, but it works together surprisingly well. Cough rating: 1.5. If you weren't prepared for this, it would be a bit much. EDIT, 9:32 pm: after a bit of research, I have discovered that "One Piece" is a very famous manga series in Japan. The hero's name is "Monkey D. Luffy." I kid you not. I recently attended a conference down in San Diego. Alas, it was not a Weird Soda conference; to the best of my knowledge, no such gathering of practitioners of the science, art, and obsession of Weird Soda Quaffmanship has been held. I envision aisles and aisles of research presentations ("Hypothetical Weird Soda Origins: The Case for South Africa"), darkened rooms wherein august and venerable names in Weird Soda present slide shows detailing their experiences, and a vendor area full of exotic and nameless brews. I shall call it QuaffCon. In any case, while down there, I visited Mitsuwa Marketlace. This is a chain of supermarkets/bazaars specializing in Japanese goods. You can get all sorts of things there: Japanese literature, Japanese furnishings, tableware, tea sets...and, of course, lots of Japanese food. Japan is recered in the Weird Soda community as the home of some of the Weirdest Soda of All Time. No flavor is too exotic, unusual, or potentially disgusting. I have heard of cucumber, yogurt, and miso, as well as others which so boggle the mind that I should not discuss them here. Many of these are probably only available by special order or by actually visiting Japan (which I would LOVE to do--grant funding, please! ), but Mitsuwa is reported to have managed to import some of the fringe sodas to our humble shores. I brought home ten or so Weird Sodas, which will be appearing in the posts of this blog as the days pass. There will be translation issues, as some of them have labels almost exclusively in Japanese. I don't read Japanese well at all; I took Japanese for a few semesters in high school (perhaps unconsciously perceiving my future career path), but to this day I can only remember a few phrases. Why, exactly, these were taught to us I cannot explain. I am not a book. (the first phrase we learned): "Boku (or watashi for women) wa hon dewa arimasen." But the pockets are big! (we saw this several times in practice conversation): "Demo, poketto ga ookii desu." May I use the bathroom? : "Toile ni ittemo ii desu ka?" None of these came in handy at Mitsuwa. Employee: "Hello, welcome to Mitsuwa. How can I help you?" Me: "May I use the bathroom?" Employee: "Certainly, they're right over there." Me: "But my pockets are big!" So unless I manage to find "Big Pocket Soda", I may have to make a few guesses. From what I've heard,. that wouldn't be the Weirdest Japanese soda name ever. In any case, I'll try to review the first later today. Our quest to find Weird Soda from around the world continues. We have so far found examples from various locations around the United States (including Hawaii), Mexico and the Himalayas (via California). A recent trip to Mitsuwa netted a number of examples from Japan. But there's one continent which generates virtually no Weird Soda. Remote, harsh, forbidding...one might even think that no Weird Soda at all would come from this place, but I have in my hands the counterexample. I speak, hypothetical loyal reader, of Guarana Antarcticá. Wait. What's that on the can? Anyway, now we have one from Brazil too. Color: pale orange, like a dark reddish ginger ale. Scent: sweet and tart, with a sour herbal tone. Kibbitzer-in-Chief: "Smells like penguin. Actually, smells kind of like Froot Loops, so I guess it's toucan." Taste: Very sweet, with quite a bit of tart. A bit like SweeTarts, or maybe Smarties. The Kibbitzer-in-Chief says it tastes a lot like cherry hard candies, or cherry pastilles. I haven't had those, but I trust her palate. The taste is very strong, almost overwhelming. There's an interesting sour note (without the sweet) which lingers around the edge. It's actually somewhat like the Sidral Mundet we had before. That was a nice apple soda. This doesn't have the same apple taste, but there's something about the taste undertones which is similar. Something in the fairly complex sweet-tart interaction, maybe. It's also a bit like Mountain Dew, but rather than the brassy sweet-citrus of Dew, it's got a more subtle tartness. It's a bit strong for me, though. I've only ever had Red Bull once, but this is a bit like that too. It has "Guarana extract" in it, so it may produce some interesting energy/hyperactivity effects. We'll call it "Mountain Dew of Madness". Quaff rating: 2.5. The taste is nice, but it's very sweet. Unpleasantly so. Here's another purchased from Galco's. (I recently made a trip to Mitsuwa to obtain some Japanese sodas; more on that soon.) This one was specifically recommended by the manager, as he claimed it has actual rose essence as a flavoring. The ingredients label confirms it: "natural rose flavor". Flower-flavored soda; pretty Weird. I think the last time I ate flowers intentionally was at my wedding. We had edible flowers in the salad. They didn't taste like much, but they were pretty. Color: pale pink. About the same paleness as the Plantation Style Mint Julep, but pink rather than green. These two should really get together. Scent: Whoa. A faint acid bite, combined with a slightly sweet yet bitter floral/vegetable scent. The vegetable is slightly reminiscent of that in the CoCo Rico, but much more pleasant. Taste: A fairly strong acid bite, with a strong sweet and floral tone. It's quite a bit stronger than it smells. The taste is actually quite nice. Kibbitzer-in-Chief: (grimacing) "That's...accurate. Very Persion. Have you ever had rose petal ice cream?" I indicate that I have not. "You have to be in a Persian restaurant to get it. It tastes a lot like that, but not as sweet." This actually tastes a lot like roses smell, but with a lot more acid. There's an interesting aftertaste; it's slightly bitter, and has a very unusual mouth feel; it's slightly astringent. The rose taste lingers for some time, competing with the acid. This is quite a bit more pleasant than I was expecting. It's a bit too oily and lingering to be refreshing, and I doubt I'd want it on a hot day. But it might actually be an interesting drink with dinner. I'm not sure what would go with rose-petal soda. Quaff rating: 3.5. Nice, if a bit lingering. Cough rating: 1. I could guess that this might be unpleasant for some, but I like it. Zoom in on the scene: our heroine, Charlotte Junebug O'Languid, is reclining on the veranda of her Mississippi estate. The air is sultry, heavy with the dampness of an early June evening. The other guests have not yet arrived for the cotillion ball in which her daughter, the lovely 16-year-old Anne Tibellum O'Languid, will be introduced to society. The drowsy hum of the cicadas makes a slow counterpoint to the burping of the alligators in the swamp nearby. Charlotte: "Oh, devil take those accursed gators. I do believe they've eaten the Swelterings from the next estate. I may swoon!" Anne strolls onto the porch, lazily wafting a fan about. Anne: "Mother, dear, do you know if Todd will be there tonight? I do hope so. Why, I've barely been able to sleep at night ever since I saw him without his shirt, poling his river barge by moonlight. I swooned. Twice!" Charlotte: "Yes, dear, of course he'll be here. I've known his father, Mattias Gritsgobbler, since we were just children. *sigh*"
Anne: "Are they related to the Atlanta Gritsgobblers?" Charlotte: "Pshaw, Anne. We'd never associate with such commoners as they." Anne: "Ah, mother. It's so hot out today. Unless someone finds me some sort of refreshment, I shall surely swoon!" Charlotte: "You mustn't, dear! That's not your swooning petticoat!" Anne: "If only someone could help me before the sweat dampens my bodice." At this point, Todd Gritsgobbler arrives. He is holding an alligator by the neck in each hand. River water courses down his hair. Todd: "Anne, I came running as soon as you mentioned your bodice!" Todd: "Mrs. O'Languid, might I impose on your gracious hospitality long enough to give this to my beloved Anne? Old Wizard Mossbucket gave it to me before he died of the dropsy." Charlotte: "Of course, young man. What is it?" Todd: "He said it was a mint julep, but with some sort of French gas bubbled through it. Just the thing for swooning, he said." Charlotte: "Let me help. You'll probably need to unbutton your shirt." He tosses the alligators aside, unbuttons his shirt, and uncorks a bottle. Together, they pour it into Anne's mouth. She stirs. Anne: "My goodness, how refreshing!" Or at least that's what came to mind when I saw "Plantation Style Mint Julep" at Galco's. I've never actually had a mint julep, so I don't really know what to expect. The slogan on the bottle is "Bubbles of fresh-tasting mint in a soft drink or mixer." Given that the bottle is not shaped like a hand mixer, whisk, or even a spoon, I'm assuming it's a soft drink. Scent: Doublemint gum combined with Mountain Dew. Taste: Faint. An initial impact of citrus, mild, followed closely by a faint mint. The mint is moderately realistic; it's not like a peppermint candy, more like spearmint. Both of those fade quickly, followed a few seconds later by a sweet citrusy aftertaste with a tinge of mint or menthol. Quite mild, surprisingly so. A bigger swig results in a stronger taste of mint, but it's still very mild. It's pleasant enough, and the mint is unusual. Kibbitzer-in-Chief: "Tastes like toothpaste tea. But not Tom's of Maine, it's sweeter than that. It could use some liquor, honestly." A very mild Mountain Dew into which someone has placed pureed Wrigley's gum (but not much). I note with interest that the ingredients list includes "Flavor". Not "Natural Flavor" or "Artificial Flavor"...just "Flavor". I find this intriguing. Next time I write an ingredients list for something, I plan to include "Food" at the top of the list. Unless it's Twinkies. You can't lie in ingredients lists. I also note that it's bottled in Pennsylvania. My mental image is now similar to the one described above, except that Charlotte, Anne, and Todd are all Amish. Quaff rating: 3. Kind of nice. Cough rating: 1. The toothpaste factor is noticeable. Ah, Galco's. If you read my account of my pilgrimage to Galco's, then you know of the rich and diverse soda ecosystem which flourishes there. Like a carbonated rain forest, there are many species of soda, beer, and wine, all living together in a delicately balanced ballet of autotrophs and heterotrophs, hunter and hunted, fliers, creepers, walkers, etc. In the beverage ecosystem of Galco's, there are sodas which stride mightily through the forest, noble countenances held up to the sun, lords of their domain. There are the swift apex predators, culling the herds of those sodas which are weak and unworthy, crisply scented, with a serious bite. There are the placid grazers--not the sort of thing you would be likely to take postcards of, unassuming and unremarkable, but as necessary to the smooth balance of the beverage world as any other beast (and some of these unexpectedly unfurl glittering violet wings and soar like cane-sugar-sweetened butterflies when you least expect it). And then there are the lowly crawling things which ooze through the leaf litter. These are the decomposers; slugs, slime molds, unspeakable fungi and arthropods, worms of the earth. The things which you know are there--whether you've thought of them with your sunlit, conscious mind or not. Deep in your mind, in the dark corners where you don't go unless you're looking for a missing sock, you've seen them--the glistening, gently heaving sides, speckled with mildew. The smoothly articulated chitinous exoskeletons, gliding noiselessly across a leg with too many joints, somewhere behind you. The nameless creeping hyphae of a mycelium which never sees the light of day, but which nevertheless waits just beneath the spongy soil. These are the parts of the rain forest which serve the darker functions--necessary for the cycle of life and renewal, even as they appear as its mirror opposite. Even the ancients knew it--the bright sun, giver of life, must daily make its journey through a dark and stony underworld in order to rise again. I fear that this may be THAT kind of Weird Soda. But here at Weird Soda Review, we do not shrink from our duty. It is our mission to know ALL that can be known of Weird Soda, and that includes coconut soda in green cans. CoCo Rico doesn't, on its surface, look threatening. It's a coconut soda. It's a pleasant shade of green with big cheerful letters and a picture of palm trees. And yet something sinister resides even in the design on the can. The name "CoCo" hangs heavy over the image of the shaved coconut, the letters cyclopean, seeming to weigh down upon it with a burden of forbidden knowledge. There is what at first seems to be a sun partially eclipsed by the palm tree, but on closer inspection, it is angular and crystalline. It can't be the familiar, warm, life-giving sun--so what is it? A strange, cold, sharp-edged entity, glowing with some sort of leprous phosphorescence. The yellowish color of this "sun" is tinged a sickly green. And below and to the right of the "Rico"--like a nagging doubt which cannot be dispelled, like a memory of unnameable deeds done in a forgotten cemetery under a gibbous moon, never to be expunged--there is the simple yet sinister label "Since 1935" on a yellowed parchment scroll. What happened in 1935 that haunts this can of soda to this day? Color: clear. I'm tempted to say "as pus", but that hardly seems necessary, even for this review. Scent: strange. There's a slightly sharp sweetness, almost like rice wine, with a salty-sour faint undertone. It's not quite like any other soda I've smelled before, and I don't think I like it. Lead Assistant: "Too sweet. Not enough sour. Bleaaahh." Taste: Er...guh...bleh...ugh. This is really, really weird. It has a very strong initial sweet--not syrupy, actually pretty crisp and clean--but it's followed a moment later by a bitter/sour vegetable taste. Lead Assistant: "BLLEEEAH! Huh..huuuhh...(wipes mouth, scrapes tongue)"
I can taste the coconut, but there is something else here. It's the taste equivalent of suddenly knowing that you're being watched--that there is something else in the room with you, even though you can't see anything. You turn, whirling, hoping desperately to get a glimpse of this unknown entity, but there is nothing there. Only the corners of your room, familiar, yet now possessed of a nameless threat. Whatever it is, you can't see it; it remains elusive. Until you feel the faintest touch of tendrils on your shoulder. Lead Assistant: "I wish one of those predators would eat it." I can't quite figure out what that taste is. I am compelled to keep sipping it, even knowing that it may be corroding my very soul, so that I can try and figure out what that second taste is. The Lead Assistant Tester has no such compulsion. Lead Assistant: "I don't think I want any more." Well, I'll do my best. It is not wholly sweet, nor sour, nor salty nor bitter. It is partially vegetable, beginning with an intense sweetness, but fading into a strange sour/salt with hints of what might be asparagus or sweet pea. It is something I cannot and must not recall. The more I drink it, the stranger it gets. The initial sweetness is now getting cloying, but it still fades without comment into the weird plant-y taste. There is not much aftertaste--just faint, mocking echoes of that sour/bitter, with a faded, dusty remnant of the sweetness, whispering structured nonsense into an ear which can no longer hear. Quaff rating: 2. Gets worse with time. Cough rating: 3. Gave me shivers. Chardonnay? What the heck are we doing reviewing a chardonnay? Are we now to be a Weird Wine Review Lab? Fear not; this is the first of the acquisitions from Galco's which we shall quaff. While wandering the hallowed aisles, eyes wide, heart open, tears of joy quivering on the ends of my eyelashes, I laid eyes on what I at first thought was wine which had been mislaid in the soda section. To my lasting delight, I discovered that it was, in fact, a Weird Soda which was based on wine. Could anything be more representative of California? Splendid indeed. This one, from the Vignette brand (subtitled "Wine Country Soda"), is supposed to be soda flavored with varietal grape juice. They are non-alcoholic, and--interestingly--have no added sugar or corn syrup. The only sweetener is the grape juice, which in this case is from chardonnay grapes. In addition, we have some visiting reviewers here in the Lab-at-Large. A talented musician and soda quaffer, Long Rod McBean (as he shall be called in the Lab) has just returned from a practice session with his band and is eager for some Weirdness. Punctilius made us dinner tonight, and certainly earned her place as a Tasting Technician this evening. Color: pale gold. A bit lighter than most ginger ales, and even most chardonnays. More like a blanc. NOTE: regrettably, we were unable to assess its "legs", as plastic cups seem to be more hydrophobic than glass, and this doesn't have any alcohol. I can confirm, however, that we did not touch the bottle to the side of the cup while pouring. Taste: We'll start with the commentary from the visiting Technicians and the Kibbitzer-in-Chief. Long Rod: "It's not chardonnay. It's more bitter than apple juice, and drier." Punctilius: "Your first sip is sparkling apple juice." Kibbitzer-in-Chief: "So is the second". Long Rod: "Tastes like quinine water." Punctilius: "No it doesn't. It's more like diluted sparkling apple juice." Punctilius: "With the slightest touch of pee." K-i-C: "Now if it was cat pee undertones, that would mean it was a Sauvignon Blanc." Long Rod: "Tastes like club soda with a touch of apple juice." The Lab staff and visitors are quite correct. The taste is much more apple juice than grape, and nothing at all like Chardonnay. It's much like very weak apple juice--sort of like the ice from ice cubes made from apple juice in failed attempts at juice popsicles--but carbonated. It's barely there. There's something odd--a faint "breadiness" to it. This really doesn't taste like chardonnay at all--or just the slightest bit, at the edges, somewhere between initial taste and aftertaste. It's not very sweet. Long Rod and Punctilius agree that there is an odd aftertaste, with bitter and chalky tones. I can taste it too, but I don't think I'd call it chalky--to me, it's more a hint of sour. It does linger a bit. Long Rod: "Needs more cowbell." Punctilius: "Needs more elephant ringing." Long Rod: "What the heck does that mean?" This leads into a long discussion which doesn't make any sense at all, but ends with Long Rod describing something so unutterably disgusting which he saw on TV that I cannot reproduce it here; it involves drinking something extracted from elephant poop. Oddly, this is not an uncommon outcome in conversations between Long Rod and Punctilius. Long Rod: "It's not that bad. I just said he squeezed the juice out of the elephant poop. And drank it." To me, that's still unutterably disgusting. Apparently, this is from Man Vs. Wild. What really frightens me is that if I were to find Elephant Poop Soda, I would feel compelled to quaff it. Punctilius: "He loves to torture me with that." Long Rod: "No I don't." The Kibbitzer-in-Chief reminds me that we do, in fact, have elephant poop note cards; the paper is made from recycled elephant poop. This leads to a discussion of whether the note cards are what is left after squeezing out the "poop juice". I re-check the bottle: no, it really doesn't contain alcohol. Long Rod: "You know, in India, they have soda made from cow urine." All right, readers. I accept this challenge. If anyone can find a sample of Indian Cow Urine soda and send it to me, I will drink it. I will post video. BONUS: That might actually taste like "warm cow piss squeezed through a dirty sock". Quaff rating: 3. Reasonably pleasant, but not interesting. You can't get drunk from it; that's kind of a pro and a con. Cough rating: 0.5. Could be worse; could be cow urine. The Weird Soda Review lab staff is spending Easter weekend in Los Angeles. After some consultation, if was determined that one important use of our time would be to send me on a pilgrimage to Galco's Soda Pop Stop, located in Highland Park. There's a link to their store over on the side, under Weird Soda Sources. "What's so special about this place," you might ask, "that it should deserve a special visit? And why would you call it a pilgrimage?" Galco's started out as a local Italian grocery store. I don't know the full history, but at some point they shifted focus to being a retail outlet for what seems like every Weird Soda you've ever heard of, and many you haven't. There's still a counter in the back were they make what are reputed to be pretty good Italian sandwiches. Back to the 110. Exit on York--wait, what turn is that? Who names a street "Avenue 64"? And after bit of fumbling, there it was. Galco's Grocery. Reverently, I parked my vehicle and made my way to the charming wooden doors. Behold the glory. Pallets and boxes of Weird Soda. Coolers spilling over with it. Aisles of wine (which is nice too, but not my goal). TWO FULL AISLES of NOTHING but Weird Soda. And some of this stuff is pretty darned Weird. I had a nice conversation with the manager (who I did not kneel before, although it was tempting) about the store and his wares. He expressed a vehement dislike of Coke and Pepsi, followed by the appearance of a beatific smile and warm glow in his eyes when he discussed the store's policy of encouraging small bottling operations. He told a lovely story about how they arranged for a limited bottling run of a root beer which resulted from a father-child effort to make root beer as part of a science fair project explaining carbonation. Other people in the store evinced similar auras of radiant contentment. One gentleman engaged me in conversation about my shirt, which transmogrified into a discussion of science teaching techniques and a shared appreciation for soda. Another woman was pushing a cart with (presumably her) chidren, enthusuatically selecting Weird Sodas with small exclamations of joy and running commentary to the children about the presumed virtues of each. The manager was spotted explaining the detailed history of a soda I had never seen before and the tangled relationship between the bottler of that beverage and the formula for Coke. It was like wandering through a wonderful library, where everyone there is there because they love to read, and there is no competition--only the shared love of the medium. It was reminiscent of some of the groups I have seen at national science conventions, where everyone is absorbed in the joy of the discussion and the ideas. It was something like being in line for a Star Wars movie, dressed as Darth Liberace, and that's not considered out of place because everyone else is just as happy as you are to be there, and showing that enthusiasm is just what you do. In short, it was a collection of Soda Geeks. And I use the word Geek as a badge of honor, simply indicating a person who is interested in and knowledgeable about something, and joyful in that interest and knowledge. I emerged from Galco's with two full boxes of treasure. Almost every bottle and can was a Weird Soda I had never seen before. If you're looking for Weird Soda, this would be a fine place to go. And if you're not in LA, they do ship nationwide--check them out. They're good people. What did I find in my mailbox tonight? Why, nothing less than a donation of Weird Soda from our Mysterious Stranger! I am so moved that I wrote the haiku above in honor of this selfless individual who has done so much to further the cause of Weird Soda research. Bless you, Mysterious Stranger! "Premiata Fabrica, dal 1889 bibite gassate Abbondio"
"Fabrica awarded since 1889 Abbondio fizzy drinks". I ask you, can a Weird Soda opera be far behind? ARIA: "O amore gassate mio, quando si burp?" Carbonated water, sugar, caramel IV, natural flavors, citric acid, salt. I must have missed Caramel I-III. Or perhaps it's not a sequel, but rather an oxidation state or some such. And I'm intrigued by the salt. Crack that sucker! Color: appears to be a rich brown. Not quite as dark as Coke or Pepsi. Color (continued): Yep. Still brown. The condensation on the sides of the bottle is pretty. Color (continued further): er...kinda coffeish? Scent: (sound of power tools, including a Sawzall) OW! Color (even more continuation): um...the brown kinda fades at the edges of the bottle. Scent: (sound of carbonation escaping) YES! Now, the scent. It's spicy and sweet, with an interesting sharp floral note, almost like intense roses. Cola-like, but not harsh or acid. Taste: Aack! A bit like cola right at first, but there is a very rapid attack of the Weird Herbal Bitter Beasties. An intense grassy-bitter flavor broadsides you just as the sweet is getting started. It's tart and bitter, like coffee mixed with lime juice, but with whipped cream on top. Really, really weird. I can't decide if it's more medicine-y or tree barky. The basic taste is pretty cola-ish, fairly sweet, but it has the massive weird stuff overwhelming it about half a second after the cola taste. I can't say I like it, but it's something different. Weird, even. The sour and bitter linger in the aftertaste, with the bitter remaining longest. At least it doesn't have the heavy, greasy feeling some others have had--that would make this really vile. Instead, it's fairly clean, but the bitter is here to stay. I'm guessing that the travellers who paused for this didn't exactly do so voluntarily. Or maybe it was something dads did to the kids in the back of the cart who wouldn't quit fighting. "You kids be quiet, or we'll pause in Tortona for refreshment!" Aftertaste update: The sour has come from behind for a stunning victory over bitter. Quaff rating: 2. You think "hey, this is a nice cola-ish drWWHHHOOAH! AAACK!" Cough rating: 2.5. Didn't actually make me want to puke, but a spit-take was a possibility for a moment. Weird facial expressions definitely ensued. But not tonight. Tonight, it's time for a head-to-head, no-holds-barred FACEOFF! I once ran across a weird internet meme about some sort of long-standing conflict between Brown Monkey and Black Monkey. People took (apparently arbitrary) sides, insisting that Brown Monkey had a more sophisticated understanding of Schenkerian musical analysis than Black Monkey, or that Black Monkey had far more exquisite table manners than Brown Monkey. Well, actually, it was more likely to involve who pwnz0red who (Black Monkey!!!! !oneone), or (even more likely) to descend into more zoologically accurate primate-like screeches of "BROWN MUNGKAY! BRRROOOWWWNNN MOOONNNNKKEEYYYY!" In any case, I never quite understood it. However, understanding is not required. Tonight shall the eternal dominance of colored-apple soda be determined in a swig-for-swig contest. These two bottleweight titans will meet on the field of carbonated combat, until only one fizzes on. In the end, there can be only one. Providing commentary for tonight's conflict will be myself and...er...me. The Kibbitzer-in-Chief is here too, maybe she'll kick in. In a spirit of mutual tolerance and respect, I'll provide backup for both sides as they vie for the title. In this corner, we have Cool Mountain Green Apple. This one is bottled by the Real Soda Company. The label has a pretty mountain on it, and urges me to recycle the bottle. Color: bright lime green. Vaguely disturbing. And in this corner, Jones Soda Red Apple. I've had Jones more than once; they're famous for their accurate reproductions of Things Which Should Not Be Sodas. The label has a picture of the Brooklyn Bridge, and also urges me to recycle it. It also identifies itself as "Sooper Dooper Soda". One can only hope that's kind of like Super Grover. Color: pale pink. The color of someone who is profoundly embarrassed by the fact that their pants have fallen down, revealing Aquaman Underoos. Ladies and Gentlemen...let's get ready to RUMBLE! Cool Mountain: a real bottle cap, not a twist-off. Unusual. Opened, a scent of green apple candy emerges, faint and tantalizing. Er...I mean it OPENS UP STRONG, slamming a POWER PUNCH of green apple SMACKDOWN on the Jones! Oh! OOOOHHHH! Jones: screw-top cap, unassuming, possessed of a certain humble populist sentiment. An interesting tart yet sweet apple scent is evident, suggestive of actual apples. BOO-YAH! The Jones comes back with a SPINNING KICK of SEMI-ACCURATE APPLE GOODNESS. Cool Mountain is back on the ropes, but not out of the fight. Round One goes to Jones. Quaffmaster:We get our first taste. OH, the Cool Mountain SURPRISES the Jones with UNEXPECTED SUBTLETY! There's very little initial taste, but in a moment it OPENS UP a CAN OF slightly tart appleish WHOOP-A** on the Jones. What do you think, Kibbitzer-In-Chief? K-i-C: Oh, my, that was one heck of a flavor--much like a Johnny Apple Treat. I haven't seen taste so much like a Johnny Apple Treat in six years of commentary. Quaffmaster: What the heck is a Johnny Apple Treat? Quaffmaster: And POW! The Jones comes right back with an INTERESTING TAKE ON RED APPLE! It comes on stronger than the Cool Mountain, with more HARD-HITTING initial flavor, but then SEGUES! YES, it SEGUES back into a slightly cool apple with a hint of bitterness. You KNOW that's GOT to hurt. Kibbitzer? K-i-C: Bleah. It tastes like fake watermelon candy. Round Two: probably a draw. Quaffmaster: That aftertaste...oh, you did NOT go there, Cool Mountain! YOU DID NOT! That distinct tartness is SO UNCALLED FOR! With a bit of subtle sweetness underneath it, even? But wait...wait...OOOOOHHH! OH, NO! Jones comes back with a sweet-bitter balance which just STOMPS the Cool Mountain. It's "SCHOOLED Mountain" now, huh? HUH? K-i-C: Where is the ref? Round 3: I give this one to Jones, but not by much. And there we have it. In the end, Jones Red Apple comes out slightly ahead. K-i-C: No it doesn't. The Cool Mountain wins. Mostly because I really like Johnny Apple Treats. They came in a little box, and rattled around, and didn't burn your mouth like Hot Tamales. I notice the soda didn't rattle, though. Quaffmaster: What exactly is a Johnny Apple Treat? K-i-C: A little hard round candy. They're about that same color. Quaffmaster: But this is soda. K-i-C: The Cool Mountain is better. I guess it's a split decision, but the trophy will have to go to...Johnny Apple Treats! Jones: Quaff rating: 3. I like this, although the odd flavor gets a bit overwhelming after a bit. Cool Mountain: Quaff rating: 3. Better than I expected, especially in the long haul. BONUS NOTE: Purely in the interest of research, I tried mixing the two. Unexpectedly, the mixture turned pale gold. And tastes better than either. See? I told you that the answer, in the end, is peaceful coexistence! Today was yardwork day at the Weird Soda Review lab. Our perimeter fence was under attack by a group of acacia trees (apparently escaped from the Big Fast-Growing Tree Which Showers You With Orange Pollenesque Substances At The Slightest Touch Lab next door). Well, "under attack" might not be quite right. The acacias were leaning on the fence. Not just leaning--leaning menacingly. I didn't know trees could have attitudes. These do. They're also quite pretty, so it was sort of like trying to chase off a group of sullen supermodels who were hanging out around my car as I came out of some bookstore where there was a sale on a Neal Stephenson cyberpunk Lovecraft adaptation. Something you don't really mind doing, and it's pleasant in a way while the task is being completed, but you still end up tired, hot, sweaty, and writing chants to Nyarlathotep to be displayed at 300 Hz on the LED display implanted above your belly button. Actually, that last part might not be the acacia's fault. In any case, I was tired and thirsty, so I thought a Weird Soda would be nice. Or interesting, if not nice. Not too long ago, the Kibbitzer-in-Chief brought home a good one. I had never heard of a soda brand called Ooba, but I like hibiscus well enough, and being called Ooba definitely makes it Weird. She also informs me that Frazier Farms (the local health food store) has a surprisingly large selection of weird beverages. Including sauerkraut-based sodas. The mind boggles. Suddenly, hymns to Nyarlarhotep sound much more sensible. Color: reddish-violet, clear. Pretty color. Scent: tealike. Very much like lightly fruit-flavored iced tea. Taste: oddly not tea. The carbonation is surprisingly strong, given that there are no visible bubbles. I'm not sure how to explain that. Underneath the carbonation, it's quite tart. There's a definite hibiscus flavor. The lead assistant tester says it tastes like sparkling pomegranate juice, and he's right. The ingredients list is short: carbonated water, cane sugar, pure hibiscus extract, citric acid, and ascorbic acid. That sounds about right; it's crisp and nice. The aftertaste is tart at first, fading into the herbal hibiscus. Very clean. Quaff rating: 4. I'd buy this again. Cough rating: 0. Even the Kibbitzer-in-Chief took a second swig of this. Finally, after years (well, months (well, weeks (well, OK, I ran across it))) of searching, I have found the elusive fourth element in the Dry Soda line. Previously, we have sampled Lavender, Rhubarb, and Lemongrass; now it's time to complete the tetrafecta and quaff some Kumquat. I don't ctually know what kumquat tastes like, having never tried one. The Kibbitzer-in-Chief, however, has. She describes it as a "very tart, bitter kind of citrus". She also claims that the rind is sweeter than the pulp (the ingredients list does not specify rind or pulp; it does not, in fact, say there is any kumquat in this at all), and says that while some like to eat them straight, she prefers them in marmalade form. I am beginning to suspect that there are culinary depths to this woman that I am not aware of. Kumquat marmalade? Come to think of it, "Kumquat Marmalade" would make a good band name. Color: perfectly clear. I give the Dry Soda line credit for using clear bottles with minimal labels; the rhubarb version, for example, is a very odd brown which might have benefitted from a colored-glass obscuration. However, this just looks like water. Scent: Pleasant citrus. A bit bitter. Smells a bit like grapefruit peel. Actually, I like the smell a lot. The K-i-C says it smells a bit like bergamot. Taste: Very mild and crisp. Mostly tastes like club soda--that slightly bitter, sour mineralish taste--with a citrus overlay. Actually, this tastes almost exactly like the unsweetened mandarin orange-flavored sparkling mineral water my family used to buy, except just a bit sweeter. It's kind of a lot like Sprite without enough syrup--you know, when you fill your cup at the fast food place with Sprite, but their syrup is almost out, and what you get is slightly sweet but mostly just carbonated water? After a bit more, the sweet is coming through a little more clearly, which is good. This is definitely a sipping soda; I think that taking a huge swig of this would be unpleasant. Let's try it. Hmm. Not as bad as I thought, but kind of a waste. The nice part of this soda is the delicate taste, which is not very perceptible with a big swig. Big swigs just make it very expensive club soda. This is pretty nice. It would be really excellent on a hot day. Quaff rating: 3.5, but keep it at a sipping pace. Cough rating: 0.5. Very little offensive here, although the bitterness might put you off if you're fond of syrupy soda. Taste: smooth, slightly thick. Effectively the same as peach nectar drinks. The taste is very similar to that of the syrup you get with canned peaches, maybe just slightly tart. Pretty nice. Less aftertaste than syrup, though, with a bit more tartness. No carbonation, of course. This is similar in many ways to the other Boing! product; a nice, refreshing fruit nectar, but nothing particularly noteworthy. Tragically, the masculine figure on the label is not a policeman, cowboy, Indian, or biker. It is a construction worker, just as on the other bottle. Rather than a stirring tribute to the Village People, it is instead a crypto-Communist paean to the power of labor. Perhaps the name of the soda is intended as a covert message to the proletariat, encouraging them to rise up (in a perky manner, I guess) and throw off the power of their capitalist running-dog bourgeoisie masters. I feel this possibility is further suggested by the fact that these bottles of Boing! lack mold codes, AKA "bottle bottom bumples". Clearly, this is intended to prevent heroic all-American agents from tracking the subversive socialist pseudo-soda siren song back to its originators. Weird Soda Review: keeping you safe from soda based political oppression since early March. Cough rating: 0.5, although it may have hidden totalitarian messages in it.